TheBrain.com has a frame that displays a Brain in its heading with other home page content below. Is there an easy way to embedd a Brain in my personal website similarly. You can embed a WebBrain in your website. Click the Share button in the upper right corner and select the embed code. See picture below. You can also File > Export > SiteBrain HTML to create a complete HTML version of your brain which can be hosted on your website. Definitely worth a read if you are building a Brain-based site. Yes, I am testing the idea for a website with your product. Thanks for the suggestion. 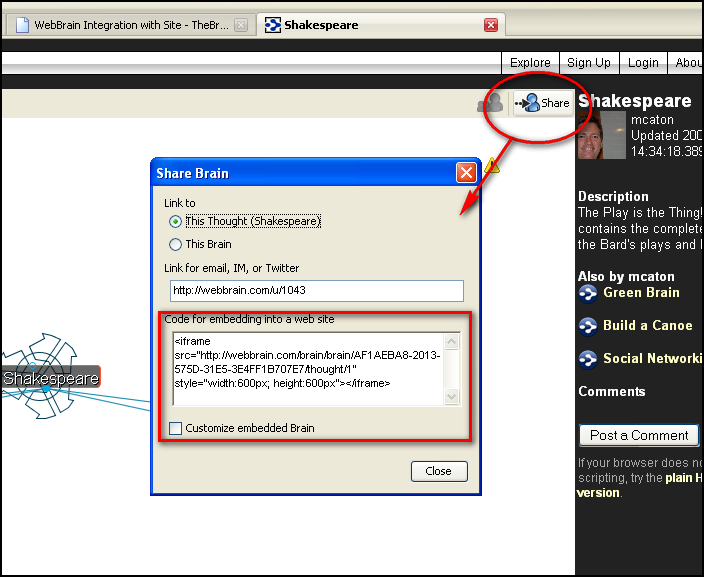 Is the share function available in the free edition - Pro Trial. If it is I can't find it? Even if you are not planning to have people go to WebBrain.com to view your Brain this is the site where it will be hosted. Visitors to your site don't necessarily have to know that, but that's how it works behind the scenes. When you publish, make your Brain either "public" or "unlisted." [Do not] set it to "private" as this would prevent it from showing on your web site. Setting it as "unlisted" will prevent people from finding on the WebBrain.com public listing of Brains - meaning the only way they'll see it is through your site unless you send them a link to it on WebBrain directly. Publish your "unlisted" brain at webbrain.com. Set up your home page. Embed your published brain in your home page.